Could you live in a floating city? The UN has suggested that one way we can survive climate change, is by building entire sea cities! See the pics and find out more on our front page this week. Elsewhere in the issue, we're hearing from BGT's Stephen Mulhern on his new show, we're learning about lemur yoga, and we're investigating what happened after Cyclone Idai hit central Africa. 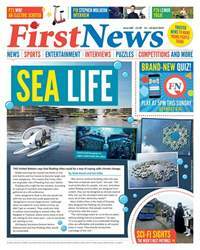 All of that, prizes galore and altogether so much more – all inside this week's First News!